The Midnight Collection: Now Available on Etsy! I am thrilled to announce the launch of the second complete printable party kit, The Midnight Collection, inspired by Disney's animated classic, Cinderella! Party kits for bridal showers and birthday parties are now available in the Enchanted Type Etsy Shop! This collection is designed for the dreamer who wants to throw an enchanted party with limited time and budget. Each kit is easy to download, print and assemble to make your dream event come true. The complete party kits include everything you need, and are customized by myself to include your party details. The kit will be sent directly to your preferred email address as PDF files, which are easy to open and print using Adobe Reader (available to download for free here). The Instant Download kits also include PDF files with everything except the invitation and personalized welcome sign. These are great for the last minute party planner (we've all been there! ), ready to be downloaded, printed, and assembled at a moment's notice. Looking to add some enchantment to your space? This bonus pack includes two 5x7 art prints from the Midnight Collection. Easily frame these timeless quotes or use some washi tape to instantly hang them on your wall! These new collections are now available in the Enchanted Type Etsy Shop to help you plan your next magical event. Make sure you check out them out before the clock strikes Midnight! Cinderella Inspiration Board + The Next Collection Announced! I am so excited to announce the next printable party kit collection that will be available on Etsy... Introducing The Midnight Collection, inspired by Disney's Cinderella! The printable party kit will be launching next week, but today you will see the inspiration board that guided the design of the collection. One of my most popular prints on Etsy has been the "So This is Love" art print, so I couldn't wait to create a collection to compliment it. I expanded on that retro design to create an entire party collection fit for a modern Cinderella. Before diving in, I gathered inspiration from around the Disneyland Resort. From Cinderella's home and castle on the Storybook Canal Boats to the Bibbidi Bobbidi Boutique (with that gorgeous Fairy Godmother stained glass window! ), Cinderella is an important part of Disney's history. The original concept art designed by Mary Blair was especially inspirational for me. I admire Mary Blair's art and career with the Walt Disney Studios, so the movies that she was a part of have a special place in my world. The collection will be launching next week, but make sure to sign up for the newsletter to receive a bonus Cinderella-inspired art print going out in the September edition! The "Have Courage and Be Kind" art print is no longer available in the Adventure Club but can be found in the Etsy shop. 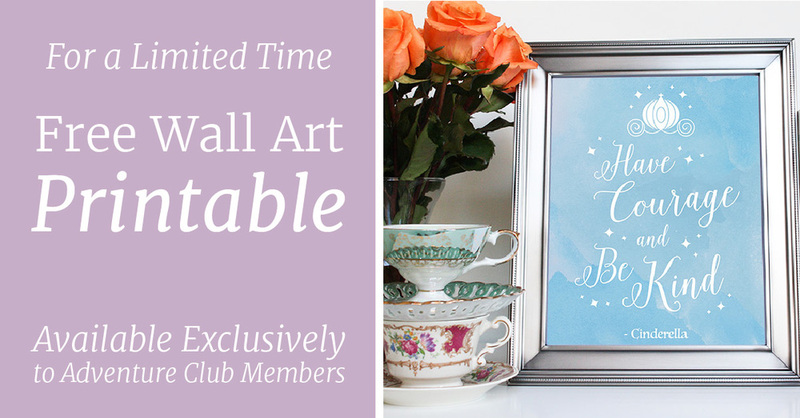 Sign up now so you never miss a free printable! Join the newsletter to be the first to know when the collection goes live on Etsy, and get instant access to library of other free downloads available now in the Adventure Clubhouse. You'll get updates a few times a month with exclusive info, free downloads and coupon codes! Join the Adventure Club... it's free! The Mermaid Collection is here!! After months of researching party planning needs and gathering inspiration from Disneyland and Disney movies, I am SO excited to finally share the Mermaid Party Collection! Inspired by our favorite little mermaid, Ariel, this printable party kit is an easy solution for your next fairytale party. 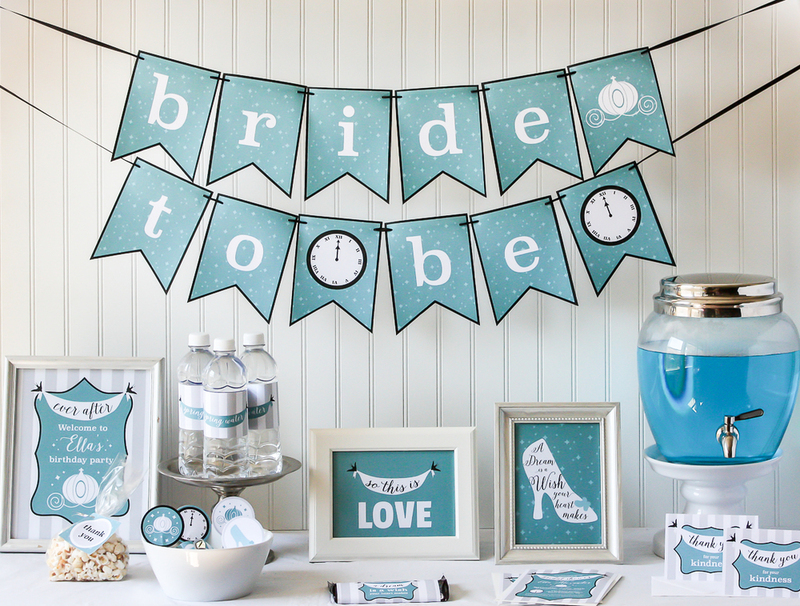 The kit was originally designed for a themed bridal shower because it is so hard to find printable kits that are for adults! Throwing a birthday party? There is a special version just for throwing a fairytale birthday bash. Alright, the moment I've been waiting for... Click here to see the entire printable party kit! Stay tuned later this month for tutorials on how to assemble the candy bar wraps, cupcake toppers and more. And check back in a few weeks for the announcement of the next party kit theme! I'd love to hear what you think in the comments below! Something missing from the mermaid party kit you would like to see? Let me know! Summer garden parties are just a little bit more magical, dining under the stars on a warm night, surrounding by good food and great friends. Every year, my parents host the Annual Summer Garden Party in the middle of summer for our friends that we call family. While I can't be in attendance this year, I love helping plan the menu, theme and (of course) create the invitations. This year, my mom was stumped on the theme, so I started digging around for inspiration. Target is always great at being on-trend and inspiring easy get-togethers with their affordable outdoor entertaining pieces. The trends popping up for this summer are giant palm leaves, indigo blue linens and bright pink accents. My mom also picked up a great set of chevron striped napkins with shades of tan, pink, blue and green that helped inspire this invitation design. The result was a modern twist on a Hawaiian party, perfect for a menu filled with fresh fish, grilled veggies and refreshing cocktails. Accents will include those chevron napkins and some amazing flamingo mini lights (because why wouldn't you have flamingo mini lights??). My parents and their friends look forward to the Summer Garden Party every year, and I can't wait to hear about the great conversations that inevitable form during an evening under the stars. A big shout-out to my parents for being my biggest fans, loyal customers, and for teaching me how to throw a great party! You can find this new design in my Etsy shop, just in time for the LIMITED TIME MAGIC Event! To celebrate Disneyland's 60th Birthday, all items in my Etsy store are 60% OFF through July 31st, 2015! This is a crazy big sale that won't happen again, so if you have you eyes on an art print or have a party coming up, make sure to order now!